One of a loose flock of ten (!) 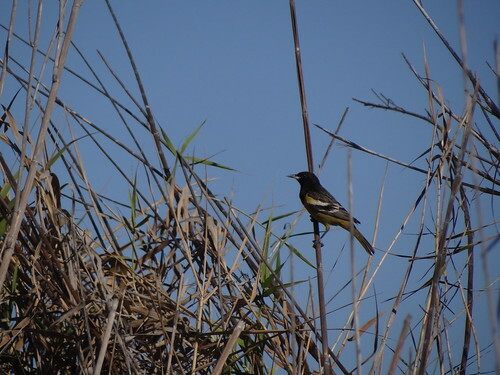 Scott’s orioles working the reeds at Todos Santos. a hypomelanistic yellow-headed blackbird on the beach at the Estero San José; I couldn’t remember ever having seen an “abnormal” plumage in this species. 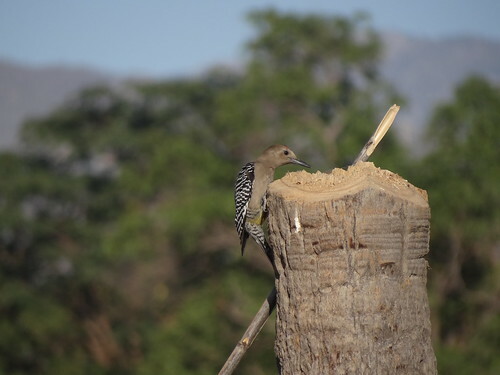 Everybody wants to see the Big Three species-level endemics in Baja, but the small, rather darkish Gila woodpeckers were just as striking to my eye. 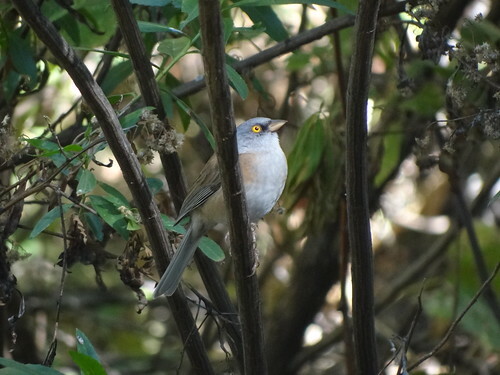 Non-avian vertebrates were surprisingly scarce. 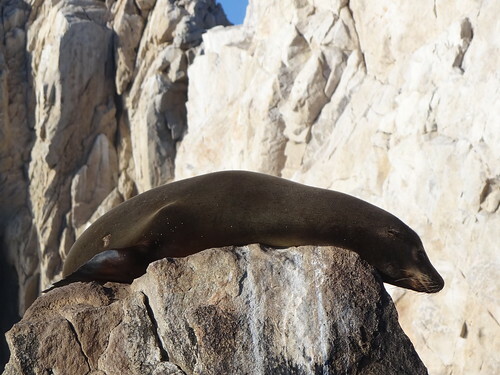 I got to see a single jackrabbit, and the highlight of our whale “watch” were the close views of California sea-lions. I’m very glad iguanas are vegetarian. 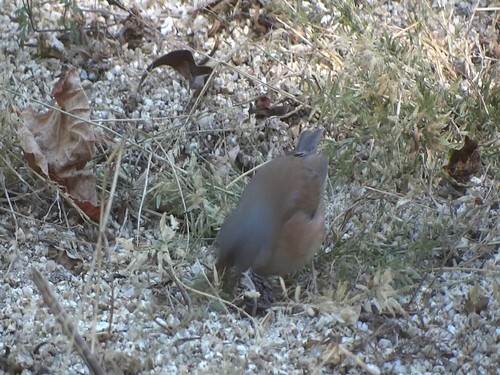 This was my first opportunity to see California scrub jays after the resplit this past summer. With an astronomical telescope and some luck, I could have been watching Baird’s juncos and royal terns all at once. This photo — below even my usual low standard — at least shows the brown nape patch said to be shown by almost all Baird’s juncos. 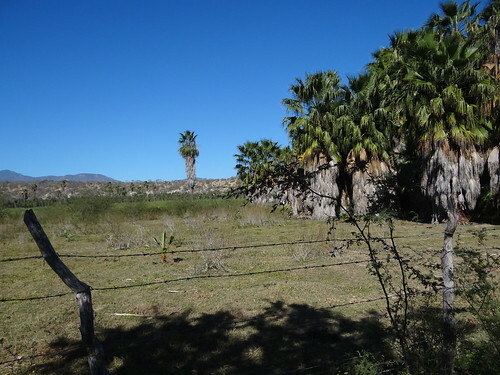 Tourists come to Baja for the sun. 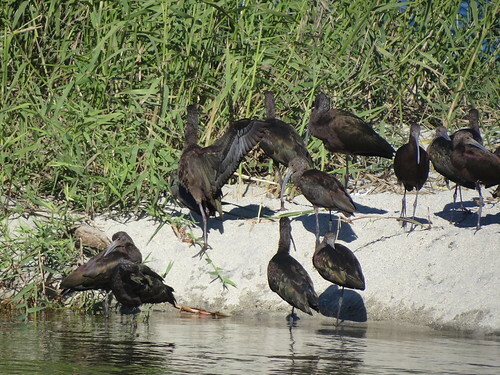 So do white-faced ibis, apparently. 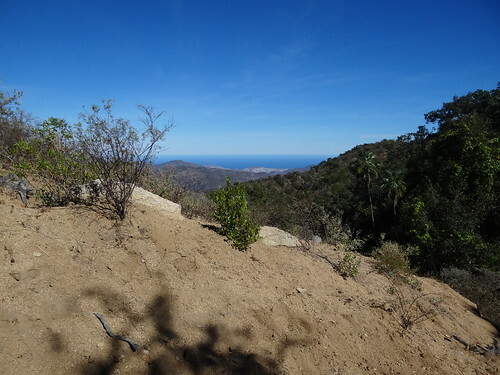 Gerardo and Leo picked us up at dawn at our hotel in San José, and three hours later we started our walk in the Sierra de la Laguna above San Antonio. It was a lovely warm morning, and there were birds to be seen along the way, to boot. 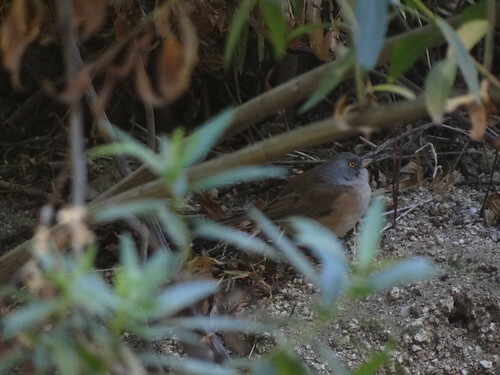 Single black-throated gray and Townsend’s warblers reminded us that we were in the southwest, and the San Lucas robin made sure we knew that we weren’t just anywhere in the southwest. 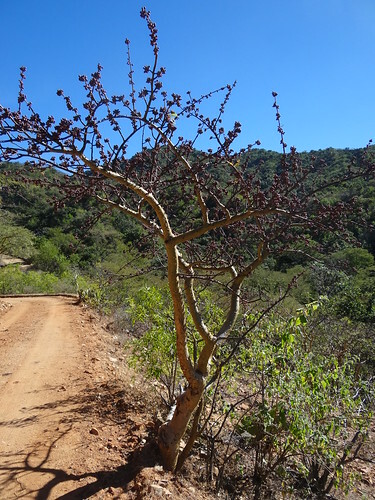 We also got to see the bizarrely dim-eyed angustifrons acorn woodpecker, and a heavily spotted spotted towhee that was presumably the aptly named umbraticola. A feral hog was a source of momentary puzzlement, and then it was higher, ever higher. I was embarrassed at having to take three (three!) quick sitting breaks for out-of-breathness, but everyone was kind about it. I’m not used to being The Problem Client, and I’m not used to being Oldest In The Group, but I guess I’d better start resigning myself to it. 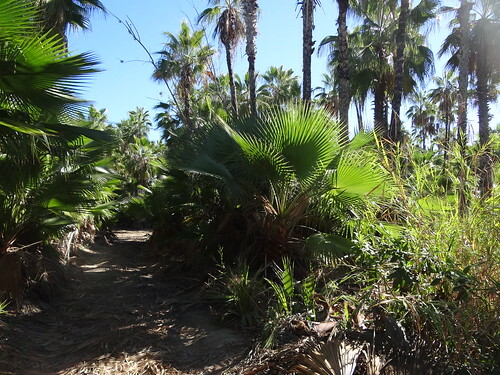 At least each of my long pauses was another chance at leisurely enjoyment of the stunning desert scenery. We didn’t have to go anywhere near the pines. 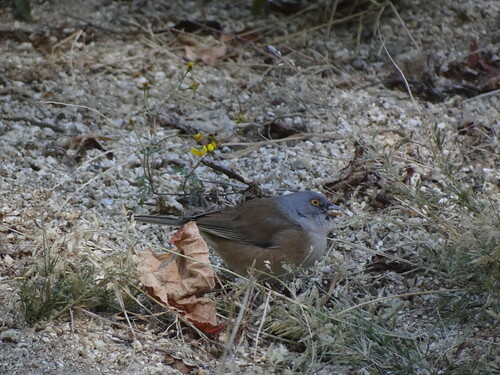 Instead, all we had to do was plop down on the roadside and wait for this most beautiful of the juncos to re-emerge from the shadows to feed in the open. The birds were nervous at first, perching in the bushes and chacking like tiny thrashers. 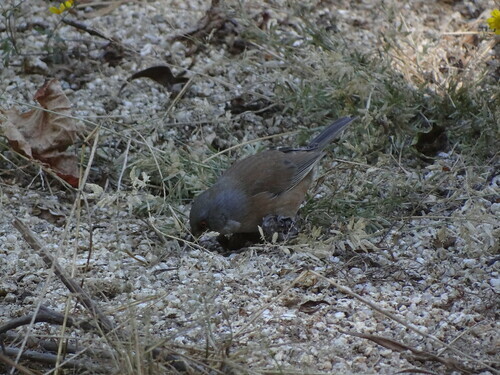 Soon enough, though, we had three Baird’s juncos on the ground in front of us, busily stripping the seeds from a grama-like grass and daintily plucking petals from low flowers. For the most part, all three were quite stolid, barely shifting their big feet when it came time to reach up to take another bite. 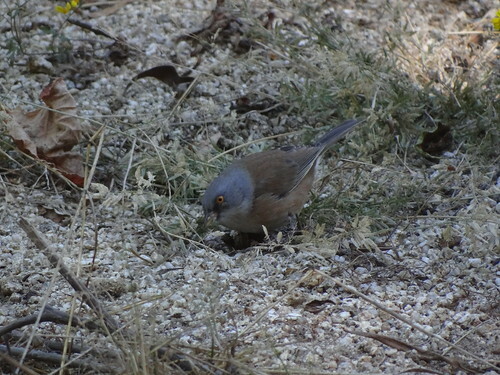 There was a little bit of occasional and unenthusiastic double-scratching, but never in the hour we watched them did I see the creepy shuffling so typical of Mexican yellow-eyed juncos, just short hops. The birds grew more trusting as time went on, and I was able to repeatedly change my position, getting closer each time, without causing any obvious alarm. 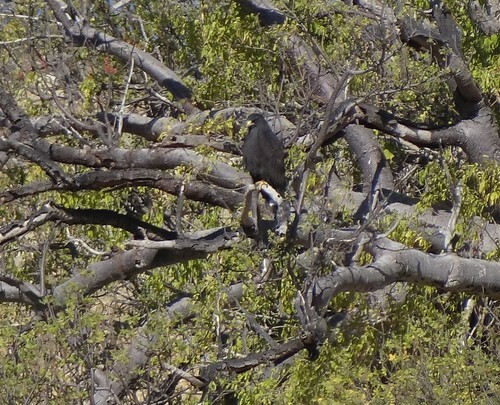 They were obviously alert to whatever passed overhead, though, reacting nervously to everything from turkey vultures to a canyon wren, and I suspect it was a flighted threat that finally chased the birds back into the dense, dark vegetation whence they had come. Thanks to Bryan, Gerardo, and Leo for making this day such an astounding success. I can’t image what the rest of 2017 could possibly bring to match it. 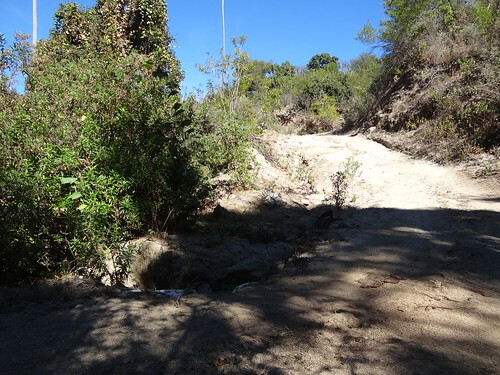 The first challenge came on our arrival above the flat salty pond known as La Poza. Where to park? The signs were everywhere and clear: not here, not here, not here! 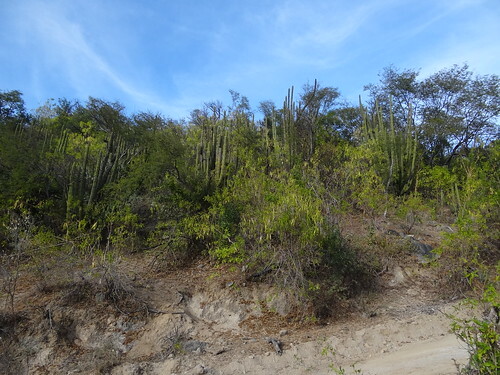 Rather than drive back up into town and walk the steep dusty streets down to the water (and then walk the steep dusty streets back up to the car), we cleverly made lunch reservations at the Posada La Poza and left our car in their parking lot, watched over by one of eleven (!!) Scott’s orioles we would see on our walk. 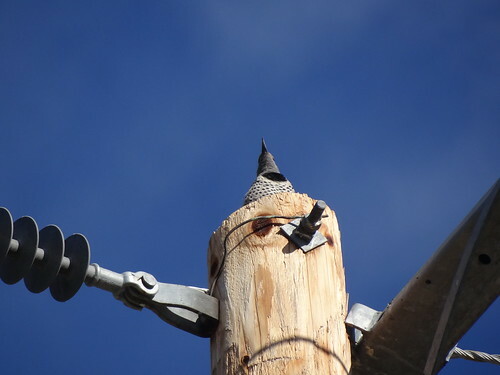 Among the first birds to pop up as we left the parking area was a gray thrasher, perching briefly on a fence then, for lingering close-range scope views, atop a cactus. 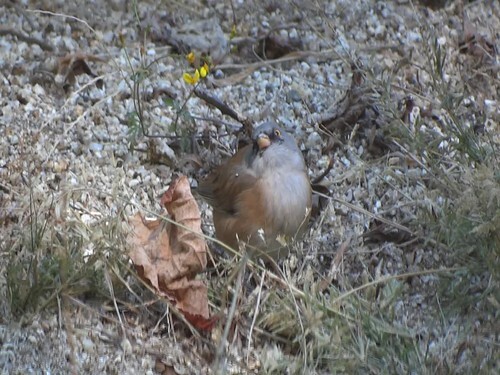 Fortunately, we still had some admiration left to bestow on the first-cycle white-crowned sparrow working the gravel nearby, the only Gambel’s sparrow we saw the entire trip. The pond itself wasn’t exactly crowded with birds. 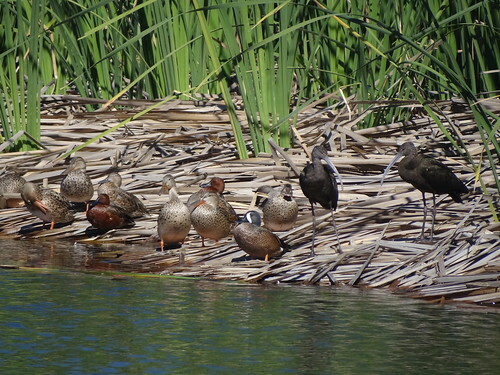 There were black-necked stilts, western and least sandpipers, greater yellowlegs, cinnamon and blue-winged teal, and a few lesser scaup and ruddy ducks; the only mildly notable bird on the water was a lone American white pelican. The beach was no birdier, and the only fly-bys were the odd Brandt’s cormorant and California gull. Out in the middle distance, though, there was activity . 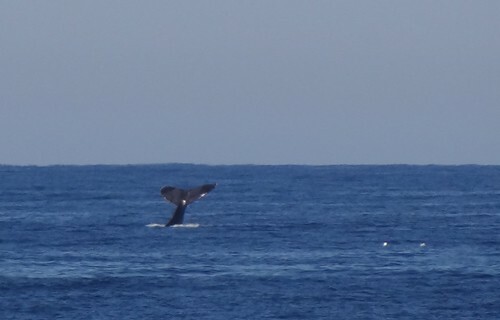 Humpback whales were nearly constantly in sight, splashing with their tails and occasionally flopping a flipper into the water. 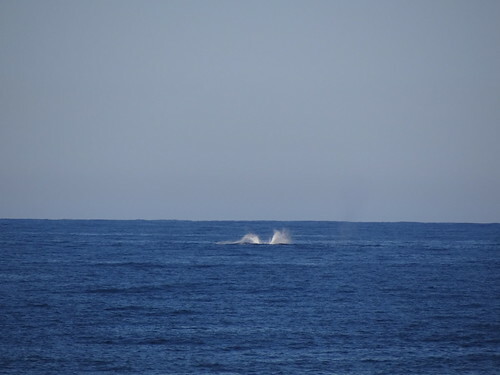 We’d been on a whale “watch” from San Lucas a couple of days earlier, with views as close as any I think I’d ever had, but how much more evocative it is to see them like this, wild and wary, out in the same waters that not that long ago would have been slick with blood and grease. 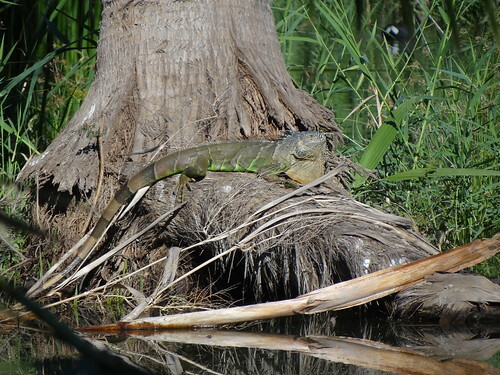 And lunch at Posada La Poza? The food was ok, the service genuinely kind, and the view out over the palms and the water pretty close to perfect. 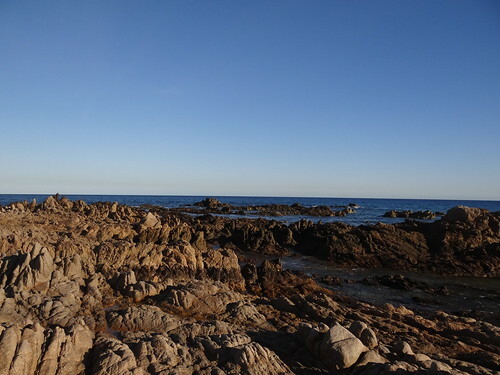 I never did find out exactly why this little beach near San Lucas should bear such an ominous name, though one look at those jagged rocks suggested at least one explanation. Not traveling by boat, we were undeterred, and visited a couple of times to see what might be hanging out in this blessedly quiet corner of the Sea of Cortez. 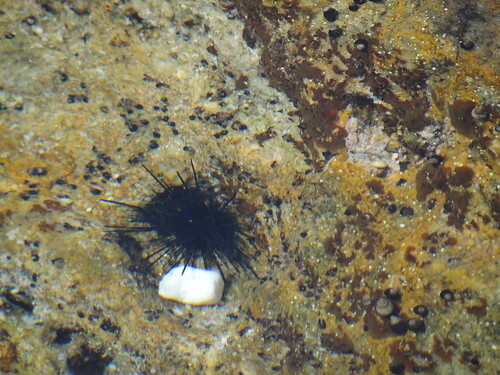 Rocks, of course, mean tide pools, and there were some neat objects to see here. 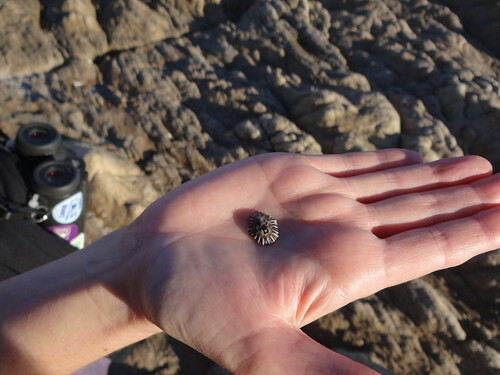 I didn’t pick this up, but think it was an echinoderm. But it’s now here on a shelf if any conchologer wants to see another photo. We were on surer ground with the birds. 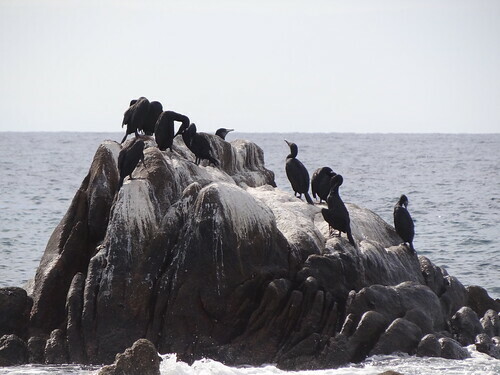 Brandt’s cormorants were the most abundant representative of their genus during our entire stay; they’ve pretty clearly been using this loafing spot for a while. 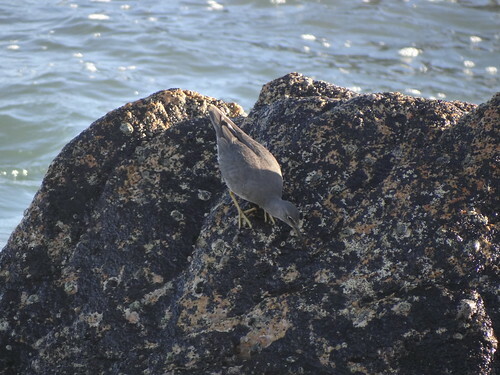 I’d expected to see some rocky shorebirds, too, maybe a dunlin or ruddy turnstone, but on our first outing all we could find were spotted sandpipers crawling busily around the crevices. Our second visit was more productive. then leaping high into the air as the water crashed around it. We finally left the tattler — a life bird for Alison, and certainly the best and most prolonged views of the species I’ve ever had — to explore the desert behind the dunes. 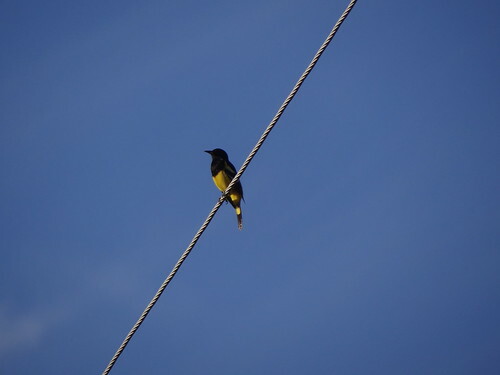 There wasn’t much to see beyond the usual ash-throated flycatchers, verdins, and cactus wrens, but I finally saw a lesser goldfinch, a bird we should have been running into every day. 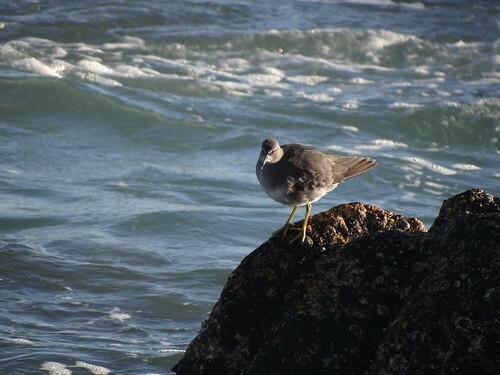 And the first time, I think, I’d seen that species and a tattler within five minutes of each other. 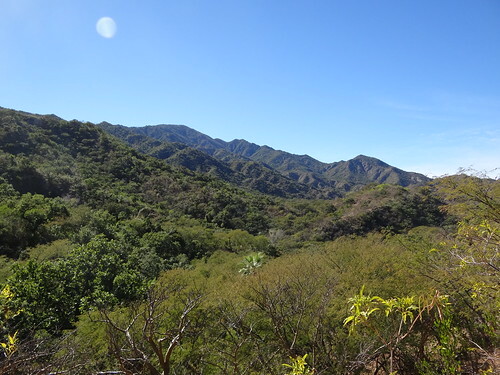 An hour’s drive north from San José is the small and pretty town of Santiago, centered on a large and largely inaccessible patchwork of pond, marsh, and pasture, protected by curious dogs and pushy cattle. Doesn’t sound all that promising. So, inevitably, we had a blast on our morning’s birding there; the only thing that could have made it better was a sewage treatment plant. 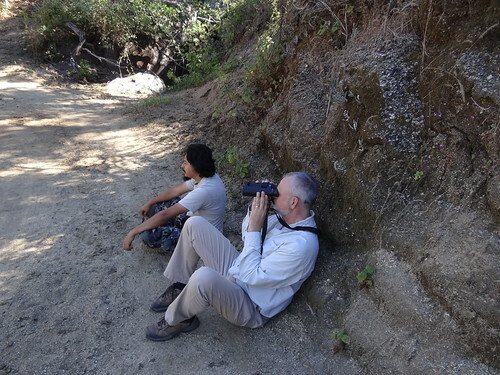 We didn’t see any real rarities, but the air was good, the weather warm, and the birding easy. 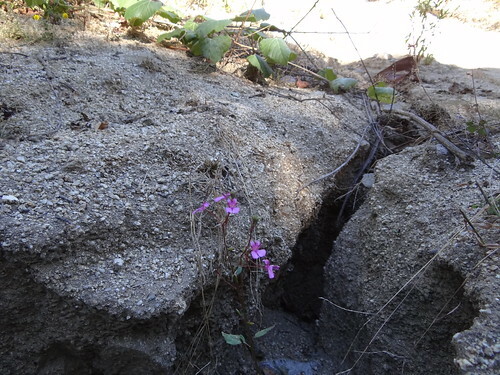 We simply pulled off at a nice weedy ditch and waited. 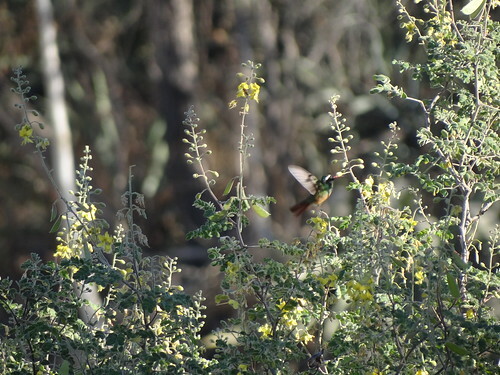 Among the first visitors — not counting house pets and livestock — was this gorgeous Xantus’s hummingbird, the most colorful of the species-level endemics of Baja California. We’d seen a few in the days before, and I’d been lucky enough to be introduced to the species a couple of decades ago in the other BC, but this individual returned again and again to feed at eye level just a few feet away from us as we stood on the roadside. We tore ourselves away to make the circuit of the town, stopping every few yards to listen and look and peer through the fences and the vegetation at the ponds. 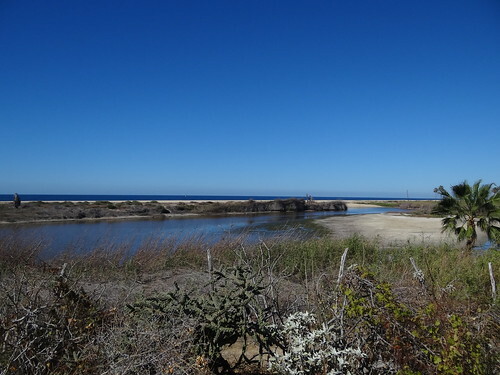 Common gallinules, snowy and great egrets, ruddy ducks, and spotted sandpipers haunted the edges, while gila woodpeckers and gilded flickers screeched and yelped from the palms and telephone poles. 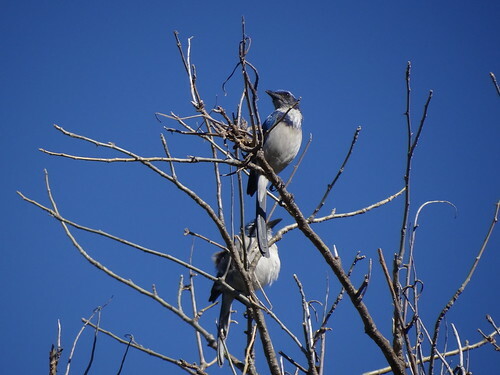 As the morning warmed, raptors became more obvious: first a Cooper’s hawk, then the usual red-tailed hawks, and late on our walk two zone-tailed hawks, obviously a pair and obviously in unchallenged possession of their hillside home. 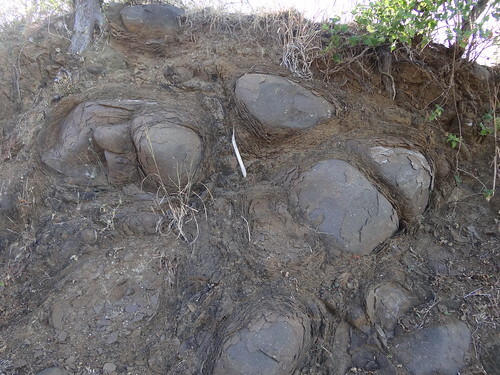 It was getting hot, and we were getting hungry, but one last dusty driveway called. 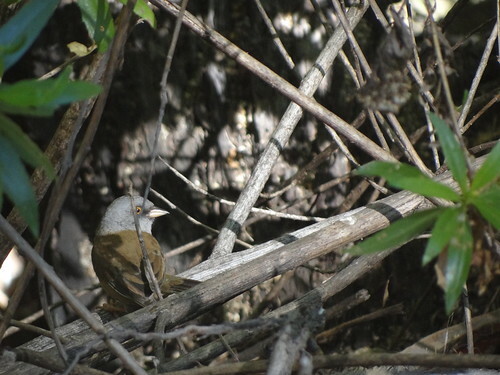 It led past a thick hedge with Lincoln’s sparrows and Belding’s yellowthroats skulking inside, into a scruffy pasture where a flock of Cassin’s kingbirds was joined by what were presumably the local pair of vermilion flycatchers and a lovely little gray flycatcher down for the winter. It was a pleasant morning’s birding, one worth repeating should you ever find yourself in BCS with some spare time. And don’t worry about the dogs and the cows: they’re friendly.